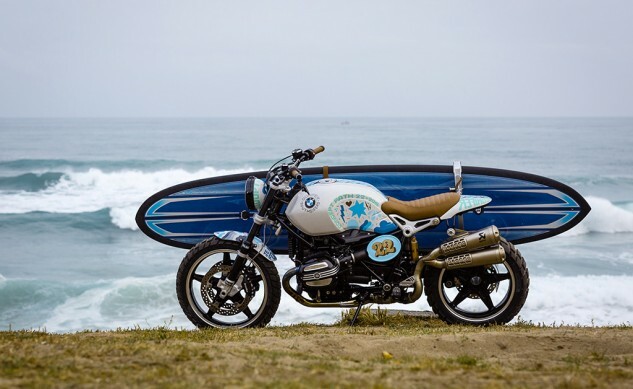 If you just happen to be on the western coast of southern France over the next three days, you should stop by the fourth Wheels & Waves Festival in Biarritz. 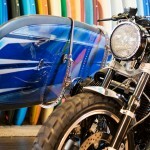 This gathering celebrates the spirit of freedom that both surfers and motorcyclists share when pursuing their passion. 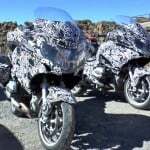 Consequently, BMW has released a experimental custom bike entitled BMW Concept Path 22 which seems to be a really sad name for such an interesting interpretation of scrambler motorcycle – until you know the story behind the name. 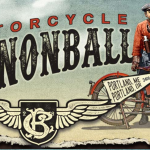 With their roots firmly planted in the 1950s, scramblers are enjoying a bit of a resurgence in 2015. 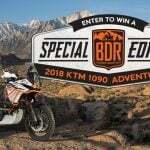 Typically, scramblers featured dirt-styled, block-treaded tires, a longer travel suspension, and the signature upswept exhaust. 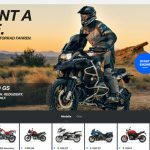 We’ve seen it in other brands’ offerings in recent years – even in the accessory catalog of the R nineT. 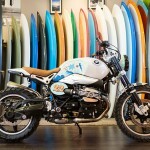 Ornamental Conifer, Mason Dyer, and BMW on a surfing-inspired scrambler. Who knew? 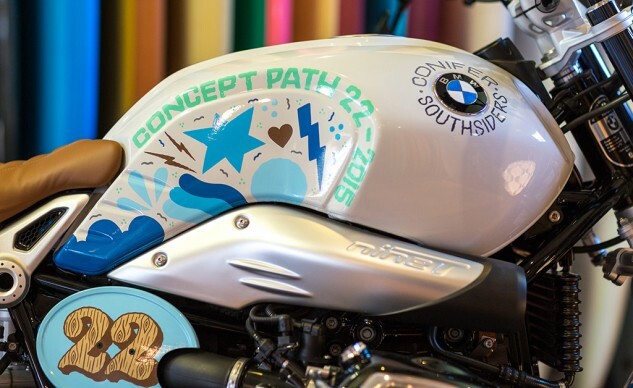 However, Concept Path 22 wasn’t just some manufacturer’s in-house design exercise. 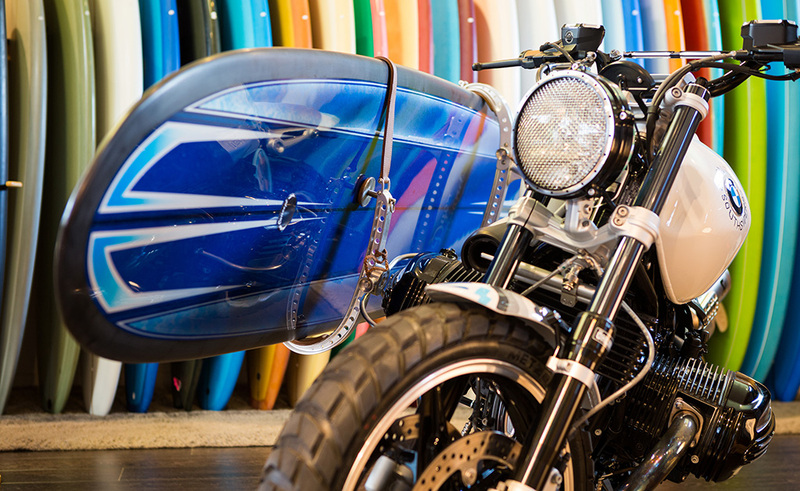 “Based on our scrambler interpretation, we wanted to create a kind of projection of the particular blend of people and cultures to be found at Wheels & Waves. And we found the perfect partners to do just this.”, explains Heinrich. 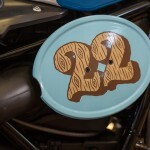 CP22 was created by the collaboration between sign writing visual artist Ornamental Conifer (formerly known as Nicolai Sclater) and the surfboard shaper Mason Dyer, founder of Dyer Brand surfgear. 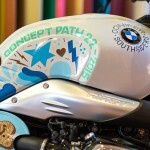 The design went further than just on the R nineT. 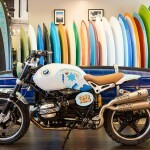 The display at Wheels & Waves will include BMW leather jackets designed by Ornamental Conifer and two surf boards created exclusively by Dyer Brand. The name “Path 22” is known by those familiar with Europe’s out-of-the-way surf spots. Path 22 refers to the sign marking a trail to a section of beach inaccessible to cars. Surfers who want to enjoy the special slice of Atlantic coastline must first walk for 30 minutes through one of Europe’s biggest pine forests. Clearly, this is a trek for those devoted to their surfcraft. 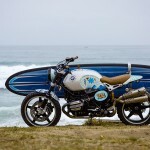 BMW sees this as a metaphor for this customized R nineT. Building on the nineT’s customizability, the Path 22 balances the utility of the dual purpose tires and protective grid on the headlight with the craftsmanship displayed by the stitched seat and the selection of accessories and high-performance parts. 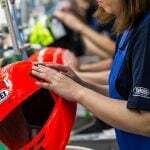 Familiar names include: Akrapovic, Öhlins, Gilles Tooling, MotoGadget, and Roland Sands Design. Finally, the stylized lettering and graphics of Ornamental Conifer ties the custom together. 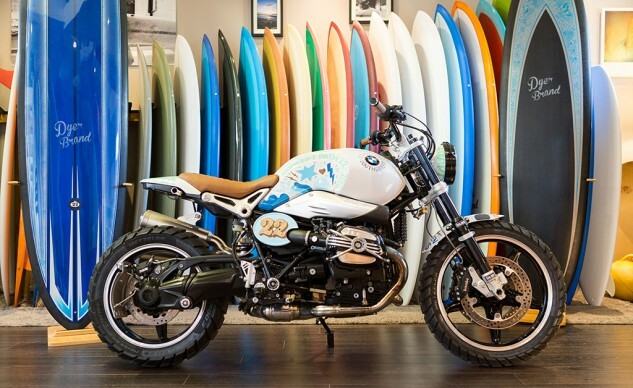 BMW Motorrad’s most notable inclusion to Path 22’s modifications is the surfboard holder mounted to the right wide of the bike. As is typical of the company’s engineering, the holder is adjustable and even removable as the situation requires. 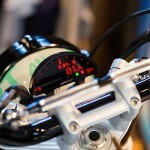 Since Dyer made two boards to display with the bike, this adjustability is a practical necessity. To see this creation in the flesh, you’ll need to visit the Wheels & Waves Festival in Biarritz, France between June 11th and 14th, 2015.